Neighbors who live and work on Syracuse’s New Westside joined us on Thursday, March 19th, 2015 for a lively discussion on what it’s like to live and work in one of the City’s most exciting up-and-coming neighborhoods. 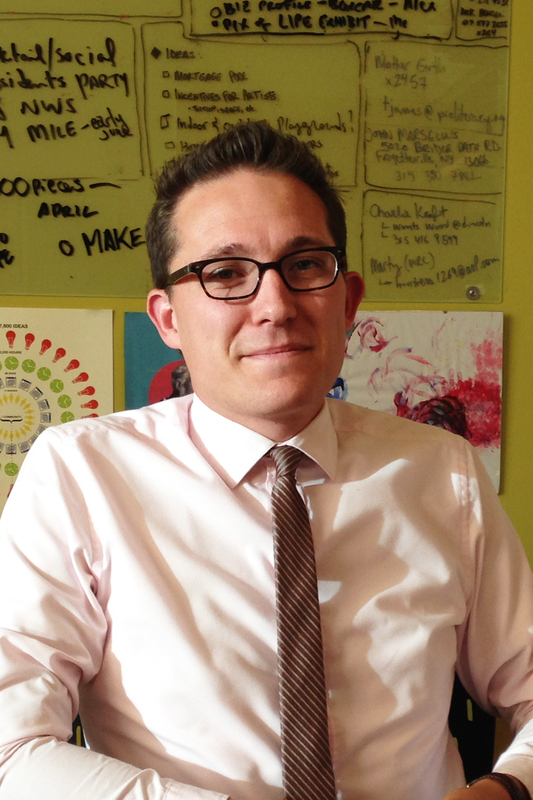 Maarten Jacobs, MSW, is the Director of the Near Westside Initiative (NWSI), a nonprofit organization working to combine the power of art, technology, and innovation with neighborhood values and culture to revitalize Syracuse’s Near Westside. In that role over the past four years, Maarten has worked diligently to ensure that the residents of the Near Westside neighborhood are actively engaged in the revitalization taking place in their neighborhood and ensuring that the community’s best interests are always represented. Similarly, with a personal passion for the arts, Maarten has pushed the Near Westside Initiative to be a truly place-based initiative with a focus on implementing creative placemaking as a fundamental strategy for economic and community development. In addition to his work with the Near Westside Initiative, he teaches Community Economic Development at the Syracuse University School of Social Work. He holds a Bachelor’s degree in Psychology and Sociology and a Master’s degree in Social Work with a concentration in Community Development and Social Action from the University of Maryland. Rick Destito grew up in Central New York and studied construction management at SUNY Canton, graduating in 1998. After graduation, he spent several years traveling the country before relocating to Syracuse in 2001. 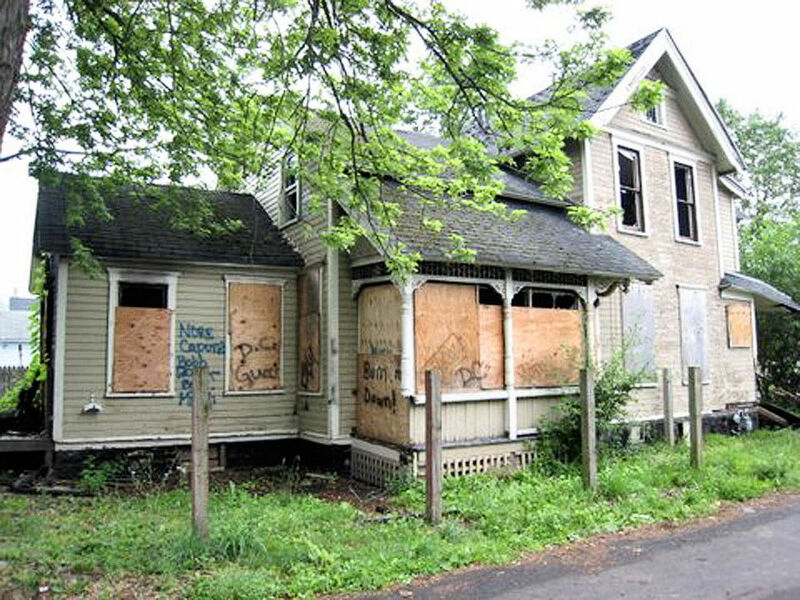 Rick initially focused his restoration on local homes, before purchasing the 65,000 sq. ft. Gear Factory building at the corner of Fayette and Geddes streets in 2005. The building, which was designed by famed industrial architect Albert Kahn, had once produced auto parts and mortar shells, but by 2005 was crumbling and abandoned. Rick immediately set about out renovating the building and reopening it as a space for local artists, musicians, and makers. 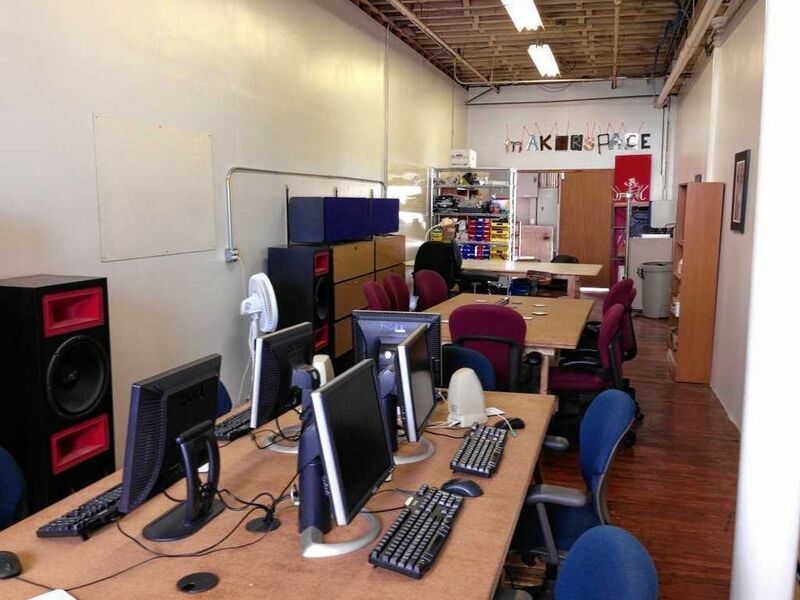 Today, some 70 people actively use the space including Syracuse’s hottest new business, Borough Furnace. Future plans for the Factory include converting the basement into music studios, reinstalling the building’s windows, and transforming the upper floors into workspaces, including community spaces where tenants can share larger and more expensive equipment. The Gear Factory. Photo from SUNY Canton. 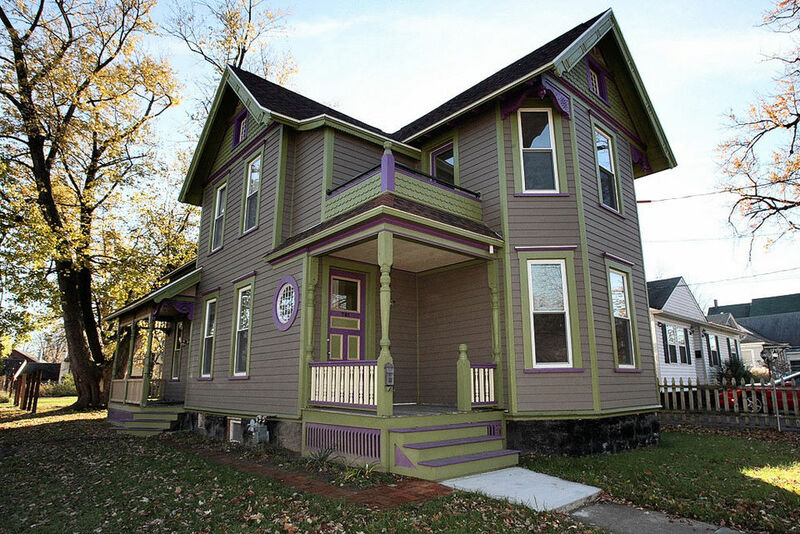 In 2008, Rick purchased an 1876 Victorian house at 721 Otisco St. for $1. He spent the next two years and $60,000 transforming the house into a living space for his family. After numerous fires and years of neglect, the house has become a symbol of Rick’s commitment to the Near Westside neighborhood he calls home. Destito home before and after. Photos from Syracuse.com. 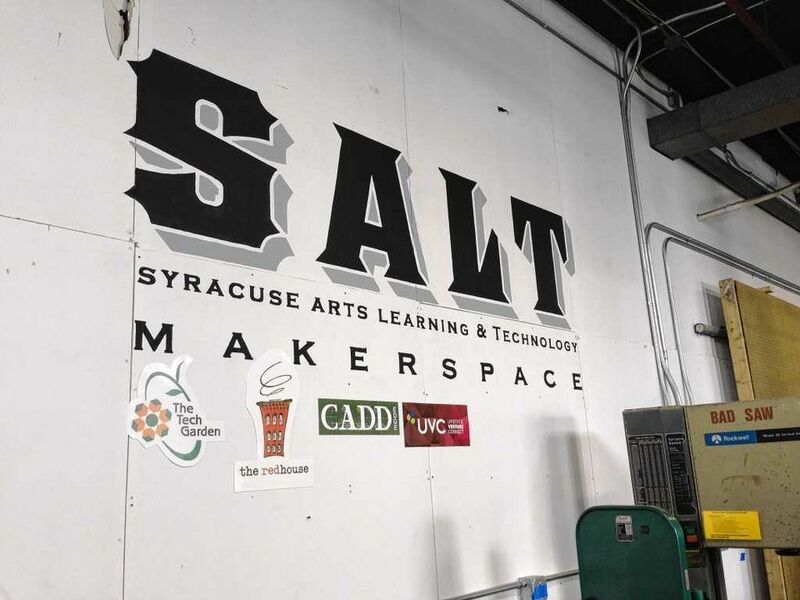 Michael Giannattasio is the founder and director of Syracuse Arts Learning & Technology (SALT) Makerspace. He holds BFA and MFA degrees in Sculpture, is an independent fabricator, Co-Chair of Public Arts Task Force for 40 Below, a university-level teacher, and a public art sculptor. Michael grew up in the Bay Area, just south of San Francisco. From a young age, he was exposed to diverse populations which influenced his outlook and goals in life. He received his first degree, a Bachelor’s of Fine Arts in Sculpture, from California State College, Chico. At Chico, he refined his process by working with every medium he could get his hands on including: glass, bronze, aluminum, wood, and ceramics. After completing his degree, Michael worked for a time as a studio assistant, independent fabricator, and professional artist. In 2009, he moved to Syracuse to begin work on a Masters of Fine Arts in Sculpture at Syracuse University’s School of Visual and Performing Arts (VPA). During this time he focused his art on experiences relating to location and expressed through digital installations. By the time he graduated in 2012, Michael had fallen in love with the City of Syracuse and its people. 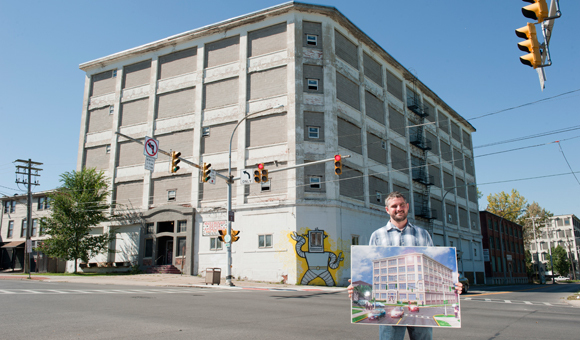 Soon after graduation Michael became involved with 40 Below’s Public Arts Task-Force, working to create collaborative and permanent public art projects throughout the City of Syracuse. At around the same time, he began working on the SALT Makerspace project. 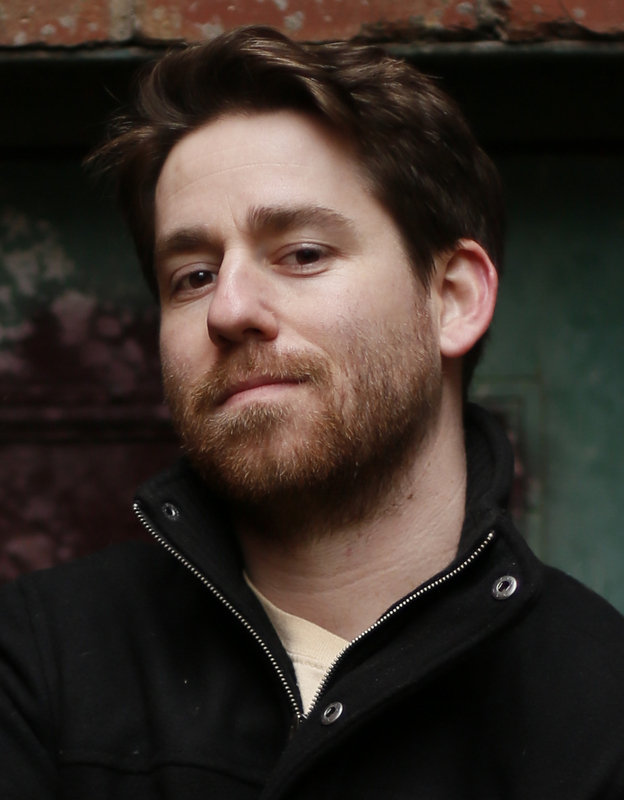 Since 2012, Michael has worked tirelessly to bring the Makerspace to life. In July 2014, his hard work finally paid off, with the grand opening of the 2,300 square foot SALT Makerspace in the Delvan Center on West Fayette Street. 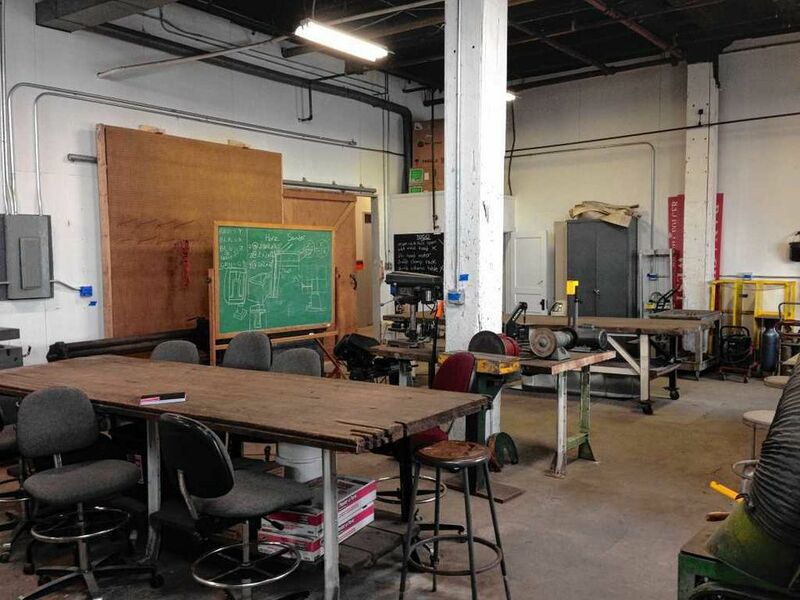 The space, which is aimed at local inventors and artists, offers members access fully-equipped metal and wood shops, a computer lab with 3-D printers and software, and a collaborative lounge space. It also hosts regular workshops on a variety of topics. The SALT Makerspace. Photos from Syracuse.com. Peter Waack and Maggie Maurer. Photo from Syracuse.com. Peter Waack is the General Manager of The Daily Orange, a student-produced news media organization affiliated with Syracuse University. 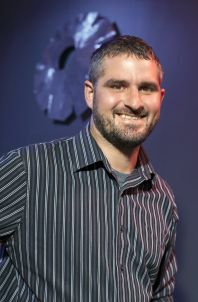 He is active in the community, sitting on the board of Directors for ArtRage, Syracuse Sports Corporation, and the advisory board of SyracuseFirst. Peter’s partner Maggie Maurer runs her own interior design consultancy and is a sales and marketing executive for an independent media company. Previously, she worked in the green home industry. 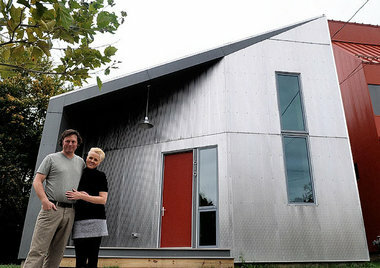 Together Peter and Maggie occupy the “R-house” at 19 Otisco Street on Syracuse’s Near Westside. The home’s design was among three winners of “From the Group Up”, a competition for affordable and energy-efficient homes to fill vacant lots in the neighborhood. The home was built in 2010 through a partnership between the University and Home HeadQuarters. 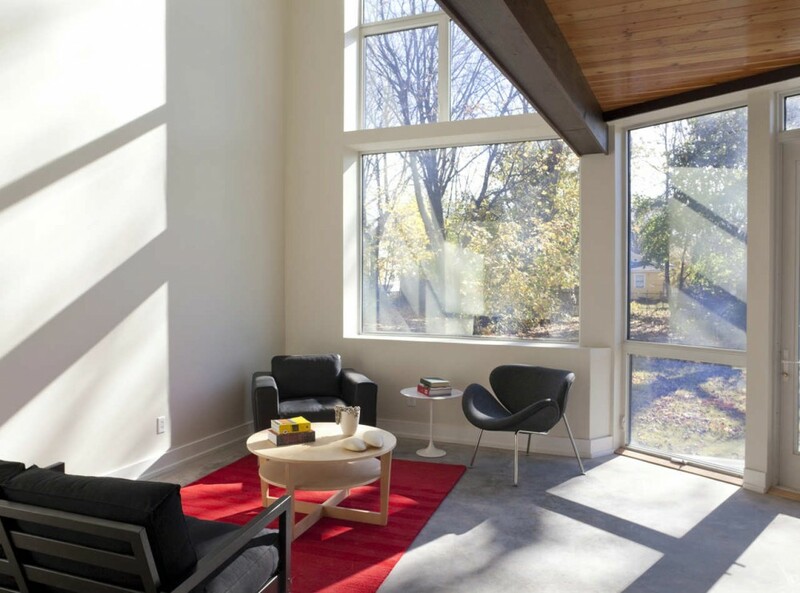 The 1200 square foot home was designed to German Passivhaus standards. Airtight and super-insulted, the home has a poured concrete floor that stores and strategically releases heat from sunlight coming in through large windows, and can be heated with the energy needed to run a hair dryer. Since moving in, Peter and Maggie have further demonstrated their commitment to green living by outfitting R-house with EnergyStar appliances and low-flow plumbing. They’ve even ensured that its exterior paint is environmentally-friendly and does not emit Volatile organic compounds. More information about the home can be found here. R-house interior. Photo from Arch Daily.